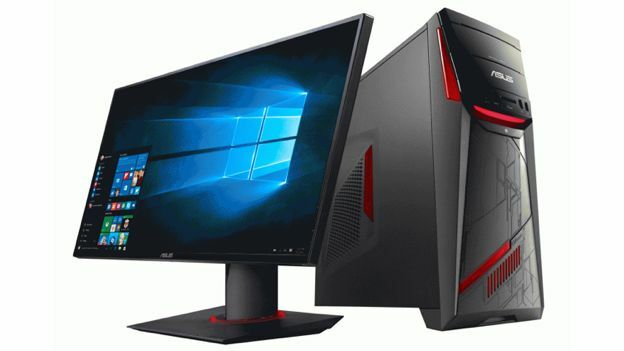 Asus has announced a new gaming powerhouse designed to up the ante in the performance department. The G11 is a full fledged tower PC powered by a Intel Core i7-6700 processor that is part of the brand new Skylake line-up and it is supplemented by a range of punchy Nvidia GeForce GPUs that range up to the GTX 980. Delving further inside the smart case, there is, as standard, an M.2 PCIe 3.0 x4 solid-state drive that is four times faster than SATA SSDs, as well as DDR4 SDRAM that brings even higher performance and USB 3.1 Gen 2. It all means that speed will never be an issue. The case is a joy to behold thanks to what Asus calls a 'menacing' red and black colour scheme that has Mayan-inspired markings, red 'flames' on the sides and a customisable 8 million colour LED effects panel that can be used to create lighting appropriate to the game on screen. It also has a 33 litre capacity for any future additions. Asus packs the machine with its Aegis II gaming utility that ensures the best experience possible when playing any game and it gives gamers a unique inside track on the CPU and memory usage plus various warnings for temperature and voltage. Supplied with a free wireless chiclet gaming keyboard with backlight, Asus has yet to confirm a release date or pricing for its powerful new rig.